Inequality in transport provision is an area of growing concern among transport professionals, as it results in low-income individuals travelling at lower speeds while covering smaller distances. Accessibility, the ease of reaching destinations, may hold the key in correcting these inequalities through providing a means to evaluate land use and transport interventions. This article examines the relationship between accessibility and commute duration for low-income individuals compared to the higher-income, in three major Canadian metropolitan regions, Toronto, Montreal, and Vancouver using separate multilevel mixed effects statistical models for car and public transport commuters. Accessibility measures are generated for jobs and workers both at the origin (home) and the destination (place of work) to account for the impact of competing labor and firms. Our models show that the impacts of accessibility on commute duration are present and in many cases stronger for low-income individuals than for higher income groups. The results suggest that low-income individuals have more to gain (in terms of reduced commute time) from increased accessibility to low-income jobs at the origin and to workers at the destination. Similarly, they also have more to lose from increased accessibility to low-income workers at the origin and to low-income jobs at the destination, which are proxies for increased competition. Policies targeting improvements in accessibility to jobs, especially low-income ones, by car and public transport while managing the presence of competition can serve to bridge the inequality gap that exists in commuting behavior. Injustice in transportation services experienced by disadvantaged demographic groups account for much of these groups’ social exclusion. Unfortunately, there is little agreement in the field about what theoretical foundation should be the basis of measures of the justice of transportation services, limiting the ability of transportation professionals to remedy the issues. Accordingly, there is a need for an improved measure of the justice of the distribution of transportation services, which relates to the effectiveness of transportation services for all members of disadvantaged groups rather than for only segregated members of these disadvantaged groups. 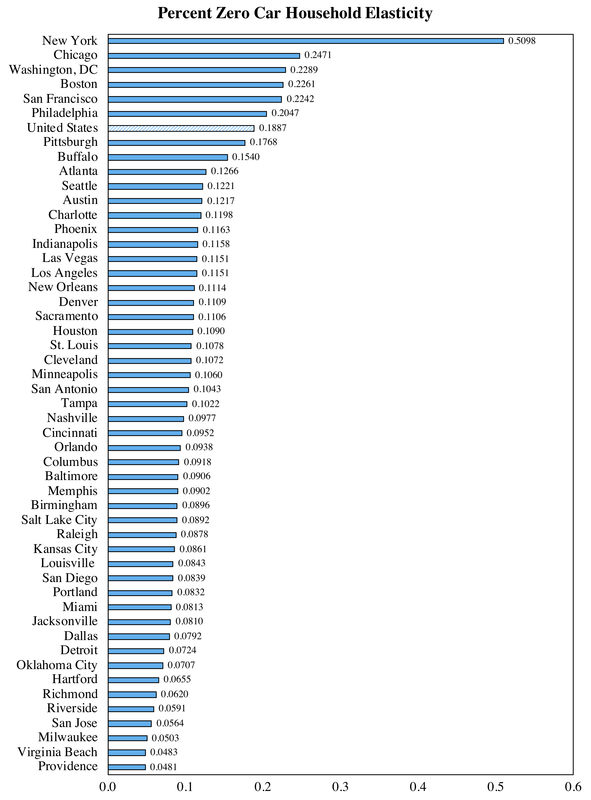 To this end potential measures of distributive justice, based on the accessibility to jobs provided by various modes, are evaluated in 48 of the top 50 largest metropolitan areas in the United States. The purpose of the study is to inform recommendations for appropriate use of each measure. While equity has been an important consideration for transportation planning agencies in the U.S. following the passage of Civil Rights Act of 1964 (Title VI specifically) and the subsequent Department of Transportation directives, there is little guidance on how to assess the distribution of benefits generated by transport investment programs. As a result, the distribution of these benefits has received relatively little attention in transportation planning, compared to transport-related burdens. Drawing on philosophies of social justice, we present an equity assessment of the distribution of accessibility in order to define the rate of “access poverty” among the population. We then apply this analysis to regional transportation plan scenarios from the San Francisco Bay Area, focusing on measures of differences between public transit and automobile access. The analysis shows that virtually all neighborhoods suffer from substantial gaps between car and public transport-based accessibility, but that the two proposed transportation investment programs reduce access poverty compared to the “no project” scenario. We also investigate how access and access poverty rates vary by demographic groups and map low-income communities within access impoverished areas, which could be the subject of further focused investments. Now only if we could do that for the whole country, hmm?